Thomas Francis O’Malley, Walter’s paternal grandfather, the son of John O’Malley and Margaret Collins, is born. John and Margaret O’Malley were married in County Mayo, Ireland. 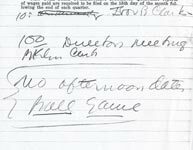 In his personal appointment book, Walter O’Malley writes “No afternoon dates. 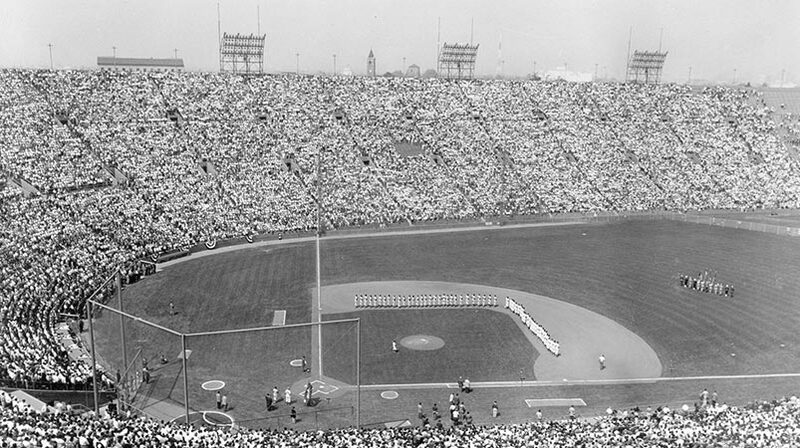 Ball Game.” The Brooklyn Dodgers hosted the New York Giants at Ebbets Field for the season opener. The Giants won, 6-4. Columnist Melvin Durslag writes in the Los Angeles Examiner about the 1959 Los Angeles Baseball Writers’ Dinner that launched the new season, after the 1958 Dodgers finished in seventh place. He quotes Walter O’Malley as saying, “We’re embarrassed by the egg we laid last year. You’re not a seventh place city. You’re entitled to the best, and that’s what our front office aims to give you.” More than a year after his career-ending automobile accident which left him paralyzed, former Dodger catcher Roy Campanella said to the audience, “I know I’m crying right now, but you can understand that...I don’t want you to pity me. I’m doing great. Sometimes I pity myself, but I know I can take what happened to me...I played baseball since I was 15 and people have been wonderful to me. I haven’t been cheated a bit.”Melvin Durslag, Los Angeles Examiner, April 15, 1959 Campanella was inducted into the National Baseball Hall of Fame in 1969.